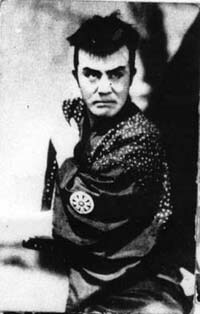 Jushiro Konoe(1914-1977) was born to be a samurai movie actor. in more than 200 movies and TV dramas. His chambara is unique. Powerful, speedy, yet beautiful. and had to be away from the movie industry for 10 years. But his talent and passion for chambara had always been with him. 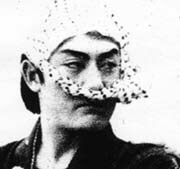 his chambara soon became essential in many movies. Konoe found his new frontier in TV. prime time until '74 with a total of 284 comical chambara stories! less than a year after his dear wife who had always assisted him passed away. Most of us still keep his chambara and/or comical talks in our mind. In fact, the more time passes, the more we miss his works. Let me have a chance to share his footage with you here. You are welcome to leave your message and/or join us in English. The pages of SURONIN NOTE are now with pictures! The second episode of "Suronin Hanayama Daikichi" is added. The second page of SURONIN NOTE is open. Another story of samurai vagabond!